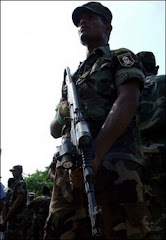 A newly appointed principal who was on his way to Vilathikulam from the Zonal Education Office in Madhu was killed, and an Divisional Education Officer was wounded and rushed to Kilinochchi hospital for treatment Tuesday morning following a Claymore ambush by the Deep Penetration Unit (DPU) of the Sri Lanka Army, said N. Selvy, Liberation Tigers Human Rights Spokesperson. The victim, identified as Siluvairasa Amalanesan, 33, was killed on the spot. An education official, identified as Christian Rajakone, 47, was rushed to Kilinochchi hospital. Both were traveling in a motorbike, driven by the deceased, to attend an event at the school. The ambush was reported around 10:30 a.m. at Sinnavalayan Kaddu in Madhu division in the LTTE controlled area in Mannar district. Sinnavalayan Kaddu is located in Madhu education zone. Thamileelam Police rushed to the site and launched a search operation.